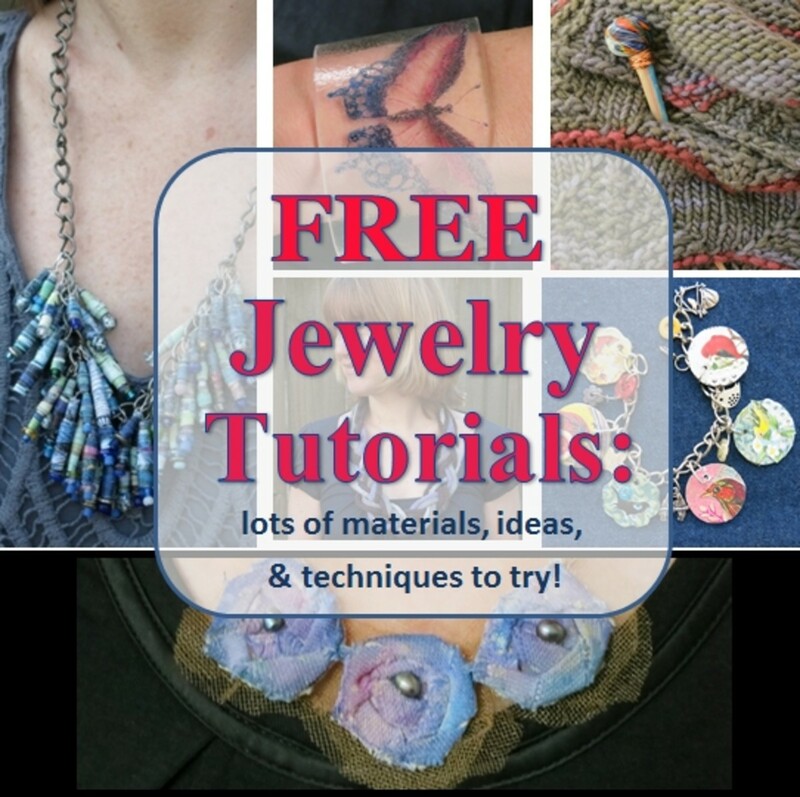 Affordable DIY Bead Jewelry Holiday Gifts On A Budget! Buy Supplies Once, Make Many Gifts! Just about everyone loves beaded jewelry nowadays! Beaded bracelets and necklaces are easy enough for anyone to make and if you know the best bead shopping tricks, you can score incredible bargains. 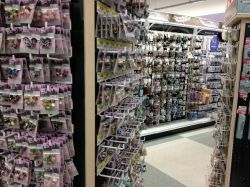 The variety of beads available is virtually infinite and beads are available in every price range. 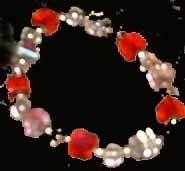 I'll show you the basic directions for making a bead bracelet or necklace you'll be proud to give! There are some design tips you should know to make your pieces really stand out. 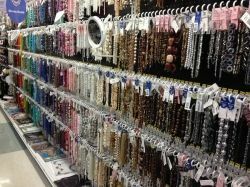 I'll also share the best tips for where and when to find the best bead bargains too! 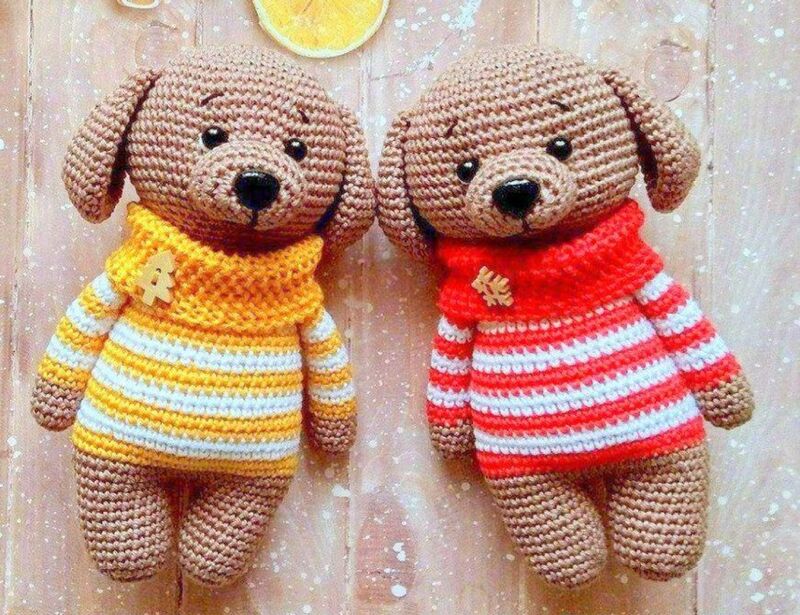 So, make your gift list, and let's get busy creating some gorgeous pieces! I know I would love it if someone made me beaded jewelry! And at the affordable cost, you can give those special people on your list a set of three, five, even 10 bracelets for next to nothing! All you need to do is add a pretty gift bag or box and you're good to go! 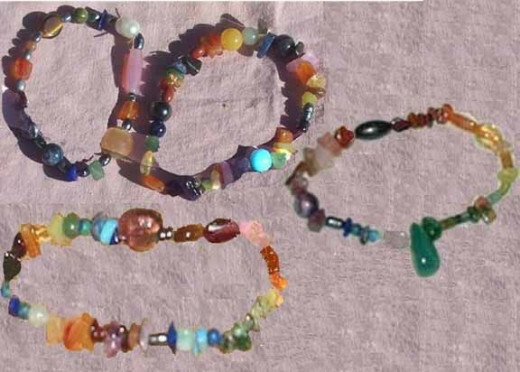 Here are some genuine semiprecious gemstone bracelets I made at a cost of less than $5 each! First, Decide What You Like! 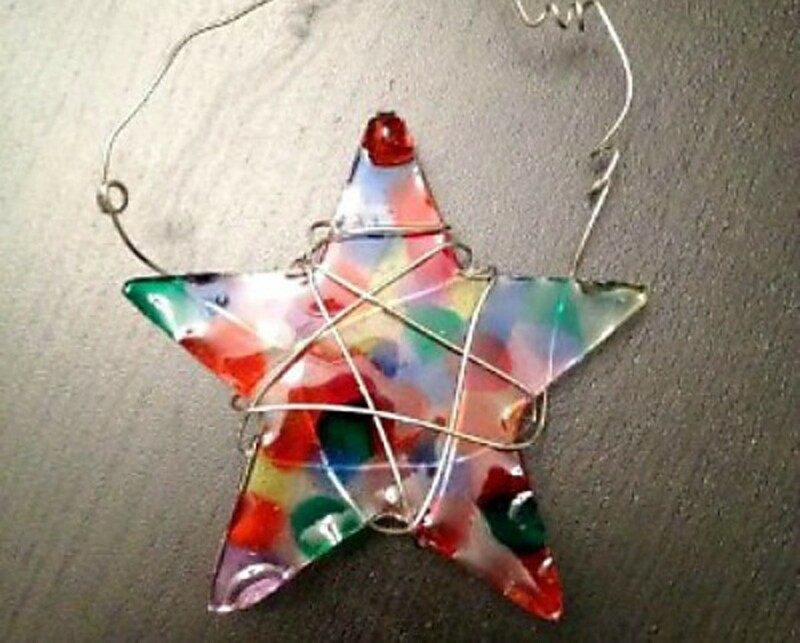 - Glass - Czech Glass, Murano Glass, etc. 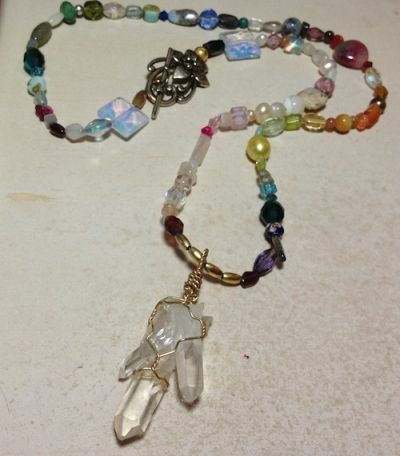 Here is a 24" necklace I just made that contains a mixture of opals, moonstones, cloisonne beads, crystals, shell beads,and glass beads. It also has a coordinating bracelet (not pictured). -.5mm Bead Elastic - the most versatile and a less expensive option. This size will fit through the majority of bead holes. - Coated metallic bead wire - will require a clasp of some kind. Fits through smaller bead holes. -Monofilament fishing line - extremely inexpensive, very strong, clear, and will require a clasp. 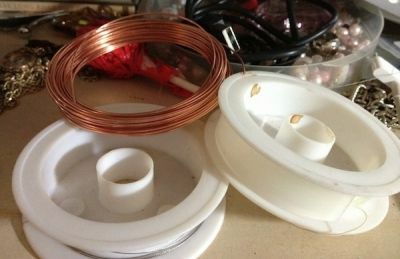 -Copper or Sterling wire - prices are low for copper, high for sterling. Will require a clasp also. Here is a bracelet I made using semi precious gemstone beads in rainbow colors on simple elastic. As you can see, the selection can be a bit overwhelming! Browse and see what catches your eye. 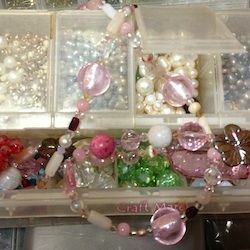 If you can, take a paper plate with you so that you can arrange strands of beads and findings in different ways. That way you can see what really goes with what. How Many Beads Should I Buy? Here's an easy rule of thumb! 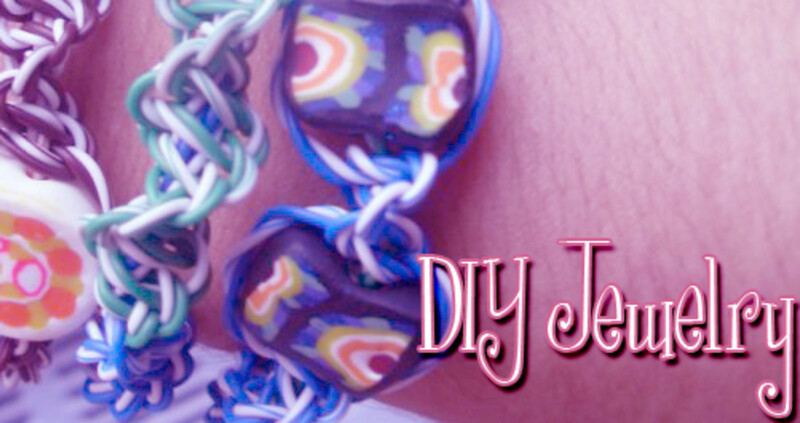 Let's say you want to make 10 bracelets. The average bracelet is 7" - 8" long. So let's say you'll need 80 total inches of beads. Add one more strand to allow for dropped beads and breakage. 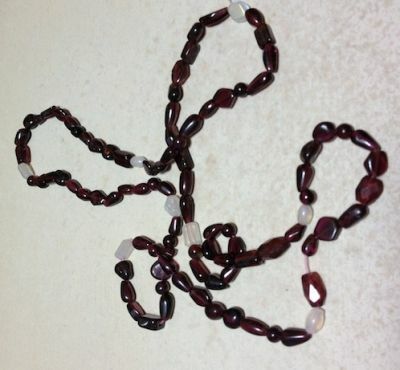 Most beads are sold in strands like the ones shown here. You may have a few beads left over, but you'll definitely have enough. What's The Best Storage Option? I've been doing beaded jewelry for many years, so my bead collection is pretty big. One smart thing I did in the beginning was to buy the same brand of locking bead storage container every time I needed a new one. 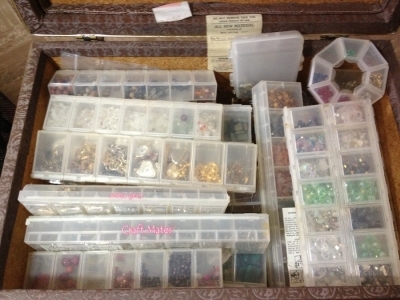 So now, they all stack neatly and I don't have 50 different shapes and sizes of containers vying for space in my box. So choose one... and stick with it. I've recommended my favorite in the Amazon Search section below. 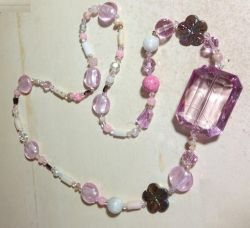 Layout your beads in your preferred design. Place one part of your clasp (lobster claw, toggle, etc.) at each end of the piece. Make sure you have a crimp bead next to each clasp piece. Don't cut your wire until you've finished the free end. At the end of the piece, put your wire through the hole on the clasp. Bend the wire backward and put it back through the crimp bead and a couple of adjacent beads. Pull the wire firmly taut. Squeeze the crimp bead with your pliers to secure the wire in place. Now go to your other end - cut the wire being sure to allow about a 3" tail of wire to work with. Repeat as you did with the other end. Secure crimp bead with jewelry cement if desired. String the beads onto your wire and tie ends in a knot as you did with the elastic bracelet. 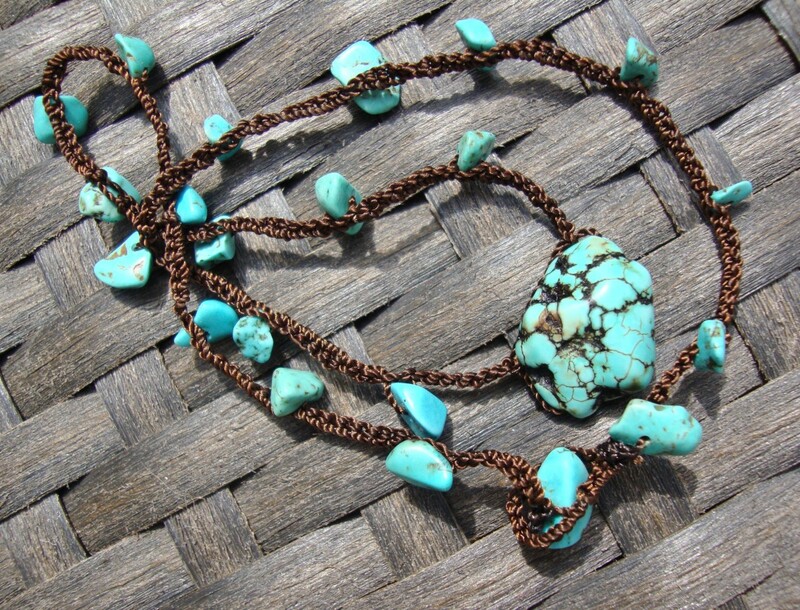 Run wire back through a few beads to hide the ends and secure with jewelry cement if desired. OR Bracelet Wire if you're doing wire bracelets with clasps. It's Nice To Include A Focal Point In Your Design! Of course it's entirely optional, but adding a focal piece is a nice touch for your finished masterpiece! Use things like a larger bead, a bead that stands out with color, a special Sterling or gold plated bead, a watch finding, etc. When you're at the various online sources, you'll have good luck if you search for "focal pendant." 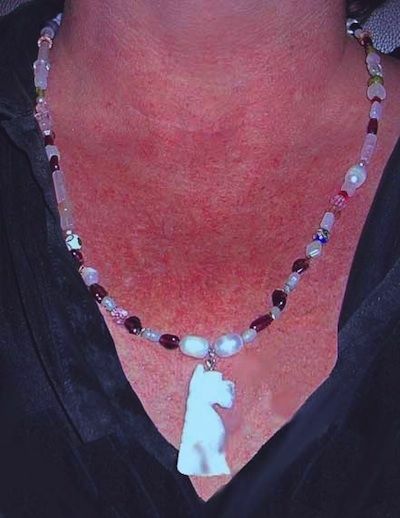 In this photo, a 1.5" carved Howlite Schnauzer serves as the focal point for this simple necklace of Sterling, Garnets, Rose Quartz, Quartz Crystals and Freshwater Pearls. Rule #1 when doing elastic bracelets - do NOT cut the elastic before stringing the beads! This just never ends well. 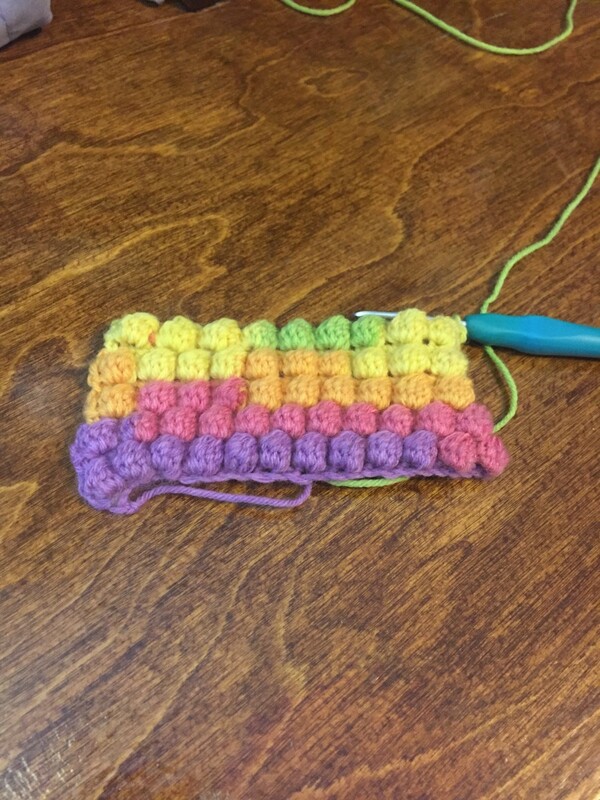 Lay out your beads on a flat surface covered with a paper or regular towel to prevent beads from rolling around. Remember when designing, your two ends will end up together. 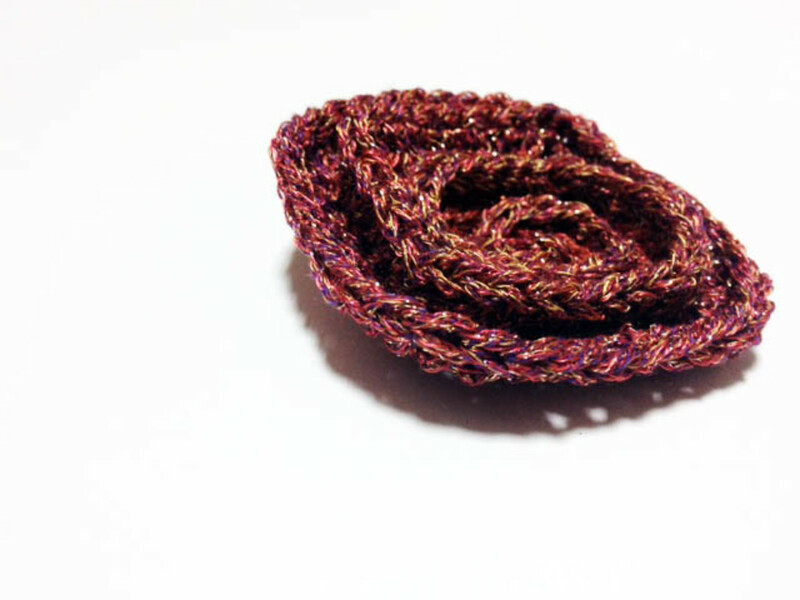 Unwind a small length of elastic.Keep the spool on your lap or somewhere it will not move! String your beads onto the elastic. When you are satisfied, tie a knot in the elastic bringing the ends together snugly,but not stretching at all. Tie 4-6 more knots tightly on top of each other. Trim off any excess elastic. You can safely cut it pretty close to the knot. Tuck the knot into the hole of an adjacent bead and secure with a drop of jewelry cement, if desired. Allow the cement to dry thoroughly before trying to put on or stretch the bracelet. Great Places To Find Jewelry Supplies Online! 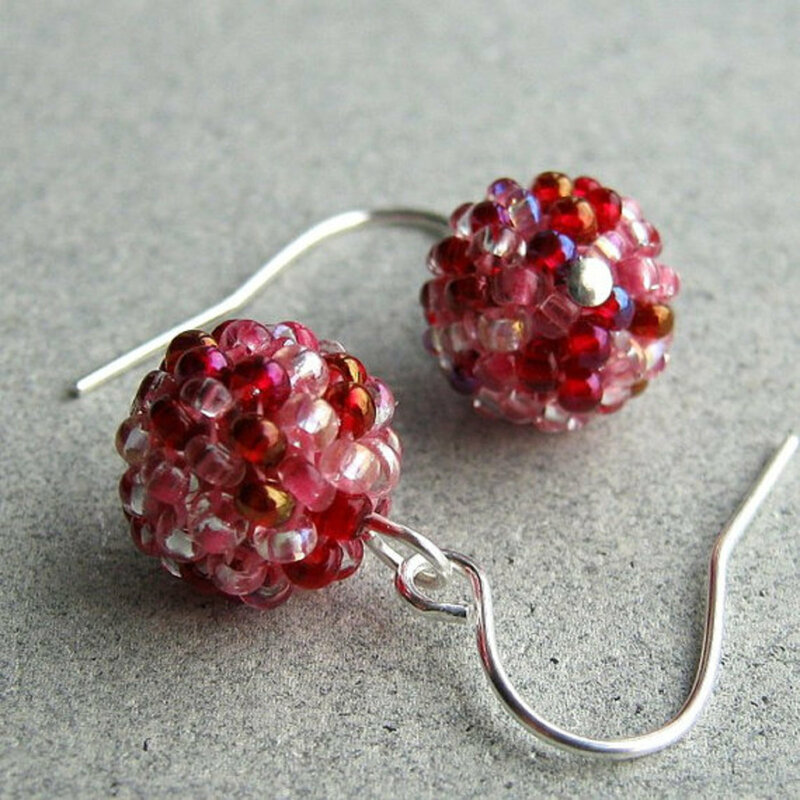 Very simple glass beads and crystals on elastic. Rainbow gemstone bracelets, all semi-precious stones on elastic. A memorial bracelet for my dog. Alphabet beads and glass beads on elastic. Freshwater pearls and crystals on elastic. 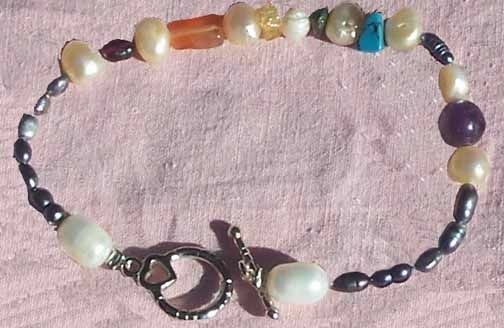 A gemstone bracelet on wire with a toggle clasp. A different kind of bracelet - all charm sections with a watch. My favorite bracelet - all freshwater pearls crocheted on fishing line! My pride and joy (but lousy pic!) 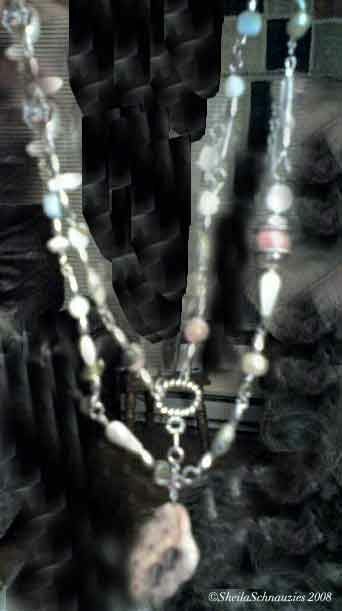 necklace all hand created wire links,opals and other semi-precious with a Mexican Canterra Opal focal. Add some spacer beads (metallics are nice) between your "important" beads to separate them and make them stand out! Search For What YOU Want On Amazon! Please Say Hello! - And tell us your plans! Just wanted to let you know I enjoyed your lens and ideas. I enjoy making beaded jewelry. This lens was a fun read. Thanks and blessed.